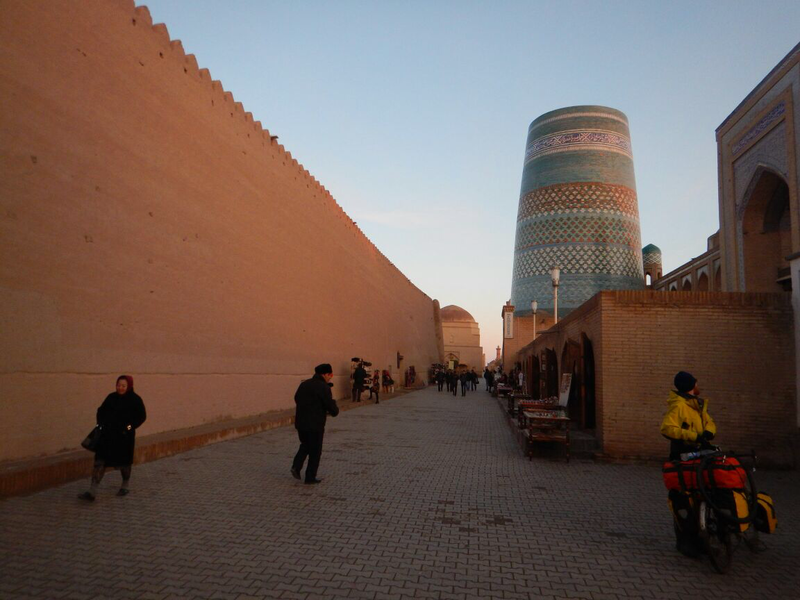 We’ve now entered our second Stan of the trip – Uzbekistan. 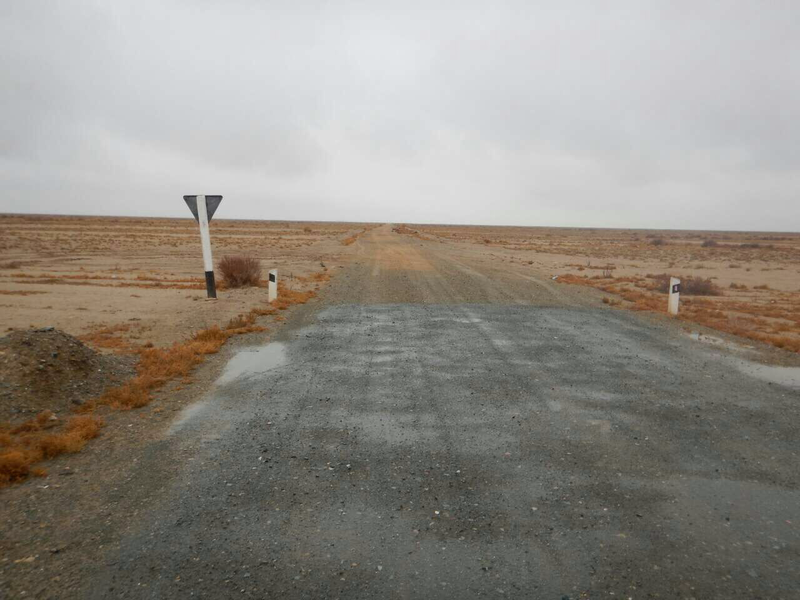 Due to not getting visas for Iran or Turkmenistan we were forced north to Kazakhstan and to enter Uzbekistan at its most north westerly point. 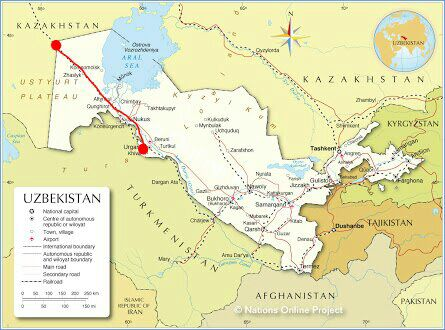 We will be leaving Uzbekistan from its most south easterly point to Tajikistan, meaning that over the next fortnight we will crossing the entire length of the country, including the full expanse of the 1600km long Kyzyl Kum desert. But with a vast area of 300,000km² it is still only Asia’s third largest desert! 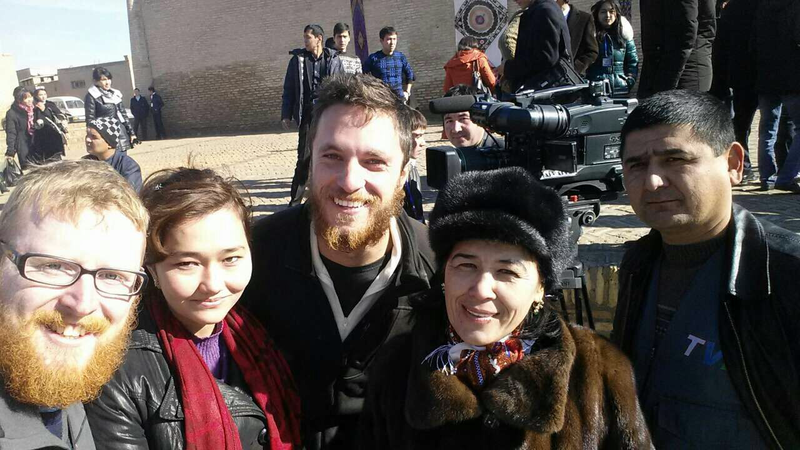 One place behind is the Taklamaklan, which awaits us in China. 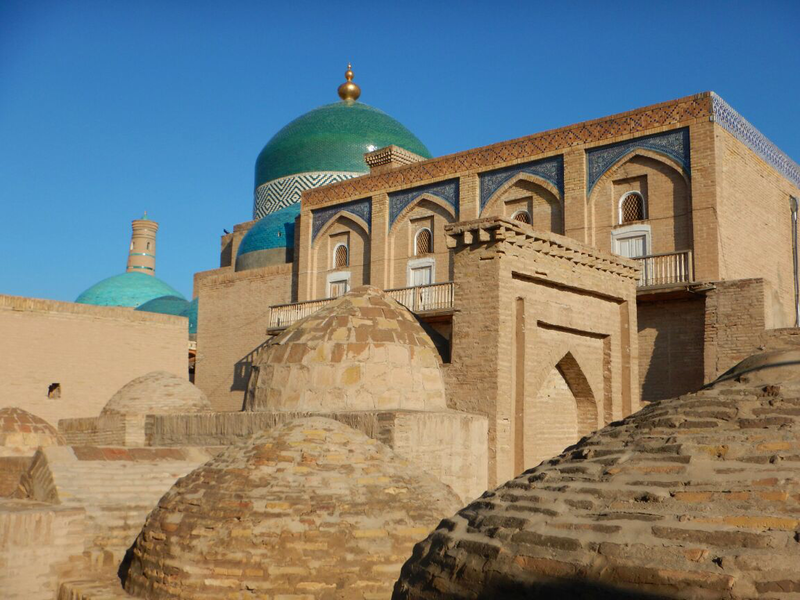 Our Uzbekistan section was to be broken into three parts: the border to Khiva (an ancient Silk Road town), Khiva to Bukhara (another Silk Road town) and Bukhara to Dushanbe, Tajikistan. As we bade farewell to the Uzbek border guards on 3 November they called after us. “Som? (the local currency) Black market!” Pointing in the direction of some people loitering between the queue of trucks and some shacks. 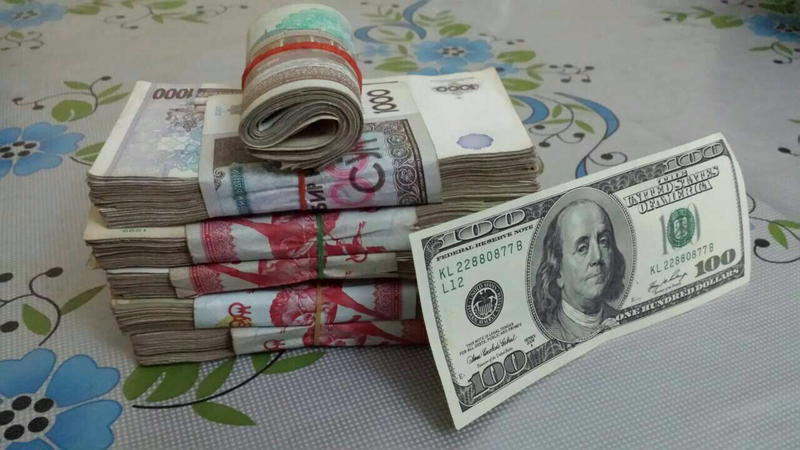 Money and the black market was to feature prominently in our journey across Uzbekistan. We approached the shady looking characters and asked for a rate, oblivious of what it should be. We handed over our dollar and they literally ran away. We looked around for police. Were we about to be arrested? We pedalled off quickly but nothing came of it. As we grew wiser we were able to haggle for better and better rates. Rates apparently fluctuated daily, or so people said, was this true or a scam? We didn’t really understand how black market rates worked so we kept hunting until we got the rate we wanted. In one town, after dark, we were led to a rather dodgy looking collection of apartment blocks to find the only man who exchanged money. Don’t mention ‘dollars’ we were warned as we approached. One crisp American note could be exchanged for four or five wads of grubby notes bundled up with string. No one in Uzbekistan has a wallet, you couldn’t fit more than a pound or so in one! Instead locals wrap wads in elastic bands and hand over tens of notes to pay for lunch! Counting out such crazy amounts causes fits of laughter from locals as we slowly leaf through the notes one after another. It takes almost as much time to count out the money for us as it takes to eat the meal! To double check the amount the patron flicks effortlessly through the stack as we stare wide eyed at his dexterity. Delayed by the drugs check at the border the day was starting to get very cold. 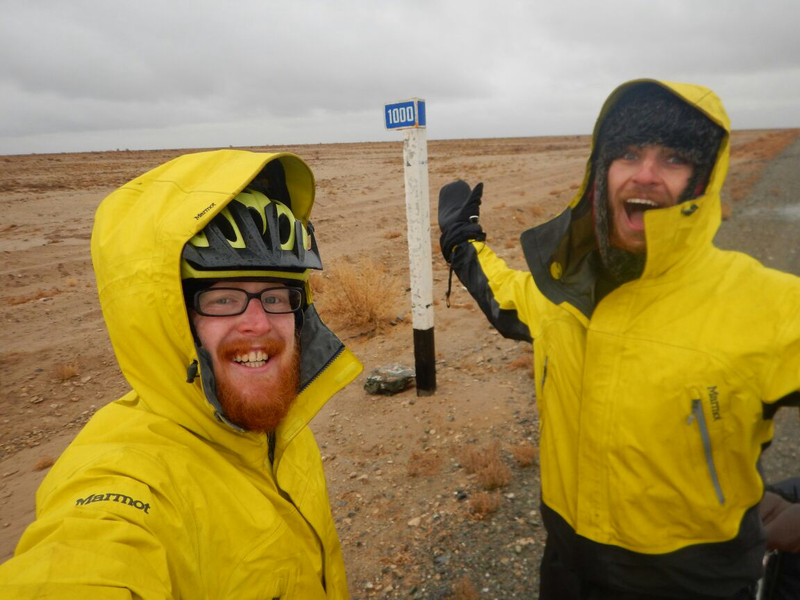 We made it 20km into Uzbekistan, stumbling across our first Central Asian cayhana, as the snow started to fall. Snow in a desert? Yes! And by the morning you could be forgiven for thinking that we were in the Antarctic desert, but for the camels, which took the place of penguins. Upon entering the cayhana we were greeted by two giggly Uzbek girls. They said we could eat and sleep, and that it was a long way to the next settlement. They weren’t wrong! What had been a barren yellow-brown landscape the day before had overnight had a pristine white carpet rolled over it. The scene didn’t look any less barren, but the snow added a little fun and excitement. That childish appreciation of snow, a magical, Christmas time substance, great for games and play, soon wore off as we realised we had to cycle through it. Building a snowman is great when you know you have a warm house to go back to, but when you don’t know where the next building might be, how far your next hot meal is away, then snow is a lot less fun! The road was slow going, we were barely able to get above 10km an hour. 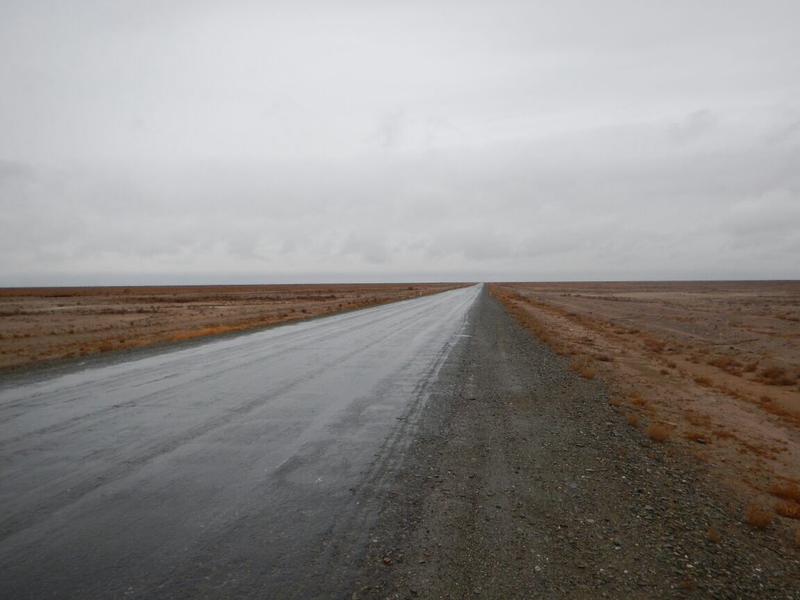 The Uzbek roads were a huge improvement on the Kazakh dirt tracks, but the number of cars coming towards us covered to the windows in mud suggested tarmac wasn’t just around the corner! There was nowhere to stop on this road, so we didn’t. We had lunch on the saddle, bread and biscuits crammed into our coat pockets, all the while pedalling, trying to avoid the potholes, gaps in the road and huge ridges formed by truck after truck taking the same line, carving the equivalent of train tracks into the road. By dark we had still seen nothing. There had been cars of course, but apart from that there was literally only desert vegetation, a train track and pylons for a 360° view. In such circumstances it feels very much as if you are not moving at all. Only the rotation of the wheels and the wind on your face reminds you of your motion. You see the pylons disappearing into the horizon, stretching endlessly. A desert is an odd place, not somewhere I’d want to spend too much time, especially alone. The road merges into the sands! We arrived at the first of many police checkpoints to come. Locally they are called ‘YPX’. 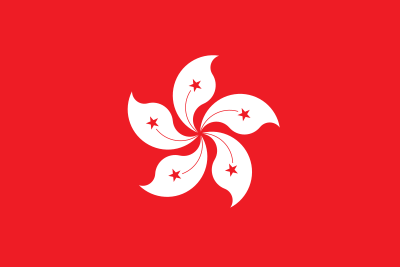 They are located on the road at the border of every province as well as at many other points along the roads. There are lots of them! We are still unsure what the purpose of these checkpoints is as they arbitrarily stop cars, letting others go without checks. Usually, but not always, we are pulled over, passports flicked through, but generally nothing more. Very occasionally our details are written down, and on one occasion we had to open a pannier each and explain the contents, followed by another thorough first aid check. Often it seems the police are more interested in our story than checking us, leading to long delays as we recount our tale. Our beards are a huge talking point. Firstly, Uzbeks really do not like beards (apparently they like clean faces and feel beards are linked with terrorists). Secondly, the police think we don’t look enough like our passport photos. 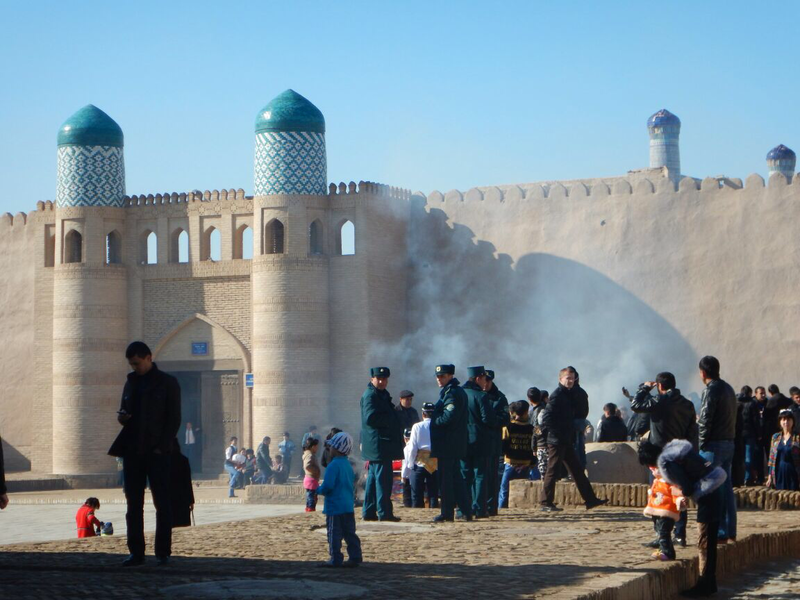 In Uzbekistan a man can be ordered to go home and shave by a police officer – it’s a big issue! We joke that the beards are to protect us from the cold and so far have got away with it. They often point at the water bottles questioning the contents, flick the bell and turn the front torch on. They are friendly enough but are unable to register us, despite being police, so not overly useful to us. 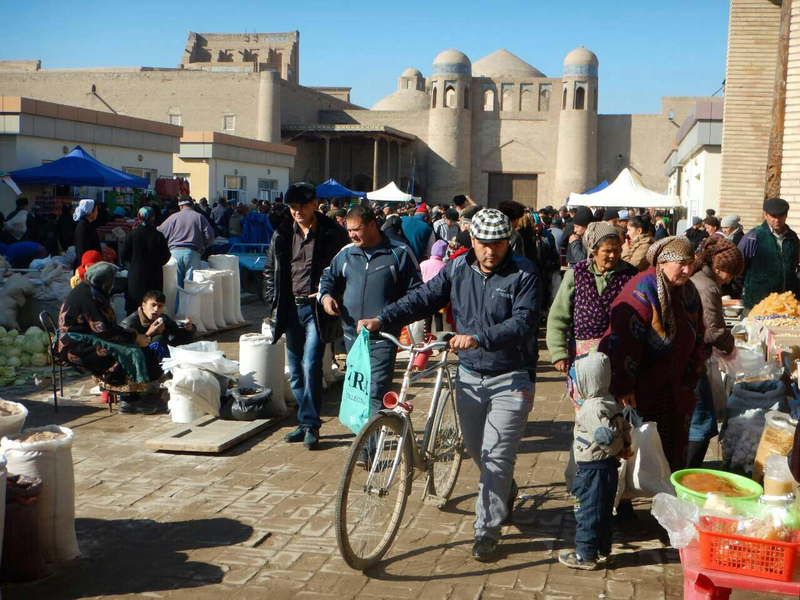 In Uzbekistan foreigners must register in a hotel every three days or risk being heavily fined upon leaving the country. This causes cyclists to have to go great distances in those three days to cross large stretches of desert in time for the next registration! On this occasion the police informed us there was a hotel in 6km where we could stay – good news! We arrived to find Mongol Rally stickers covering the front door of the roadside inn. Everyone passing through had to stop here, we knew there was nowhere else for 100km either direction. 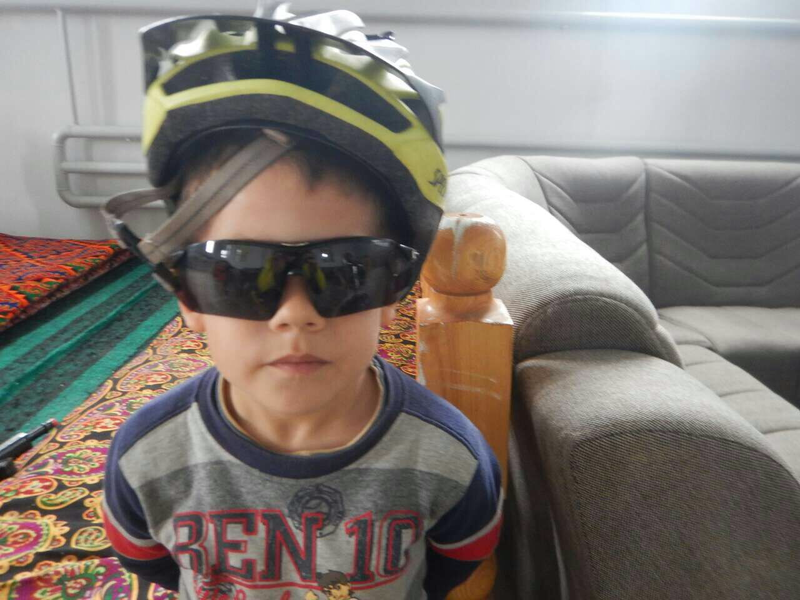 We’d cycled 145km on our first full day in Uzbekistan. We were absolutely exhausted. 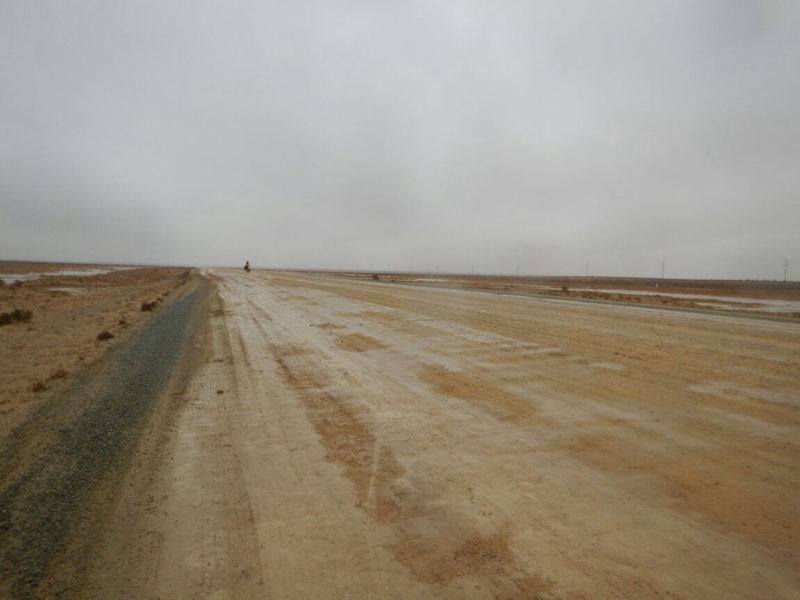 We knew it wasn’t going to get easier as we still had a lot of desert to go and not many days in which to get to Khiva, our first destination. We awoke to light drizzle. Better than snow? Maybe. However, as soon as we left the shelter of the solitary building the drizzle turned to heavy rain. 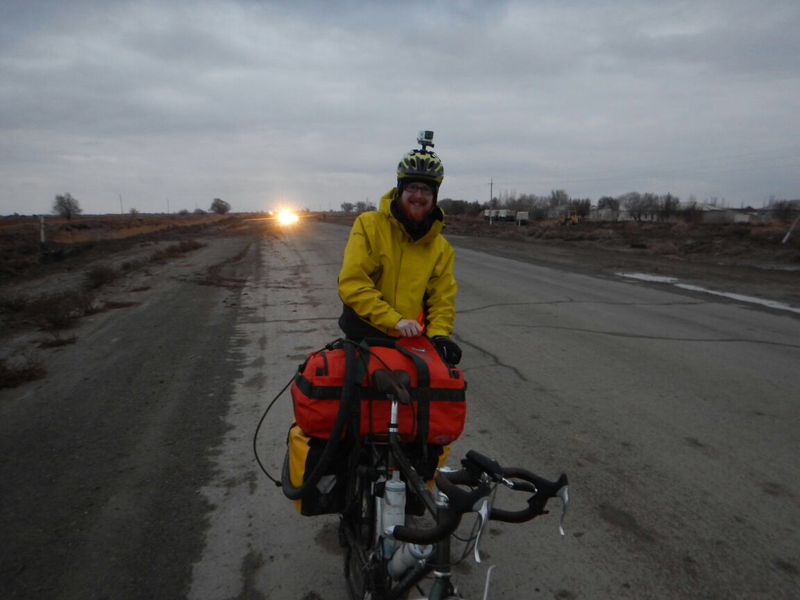 Rain turned to snow, and combined with very strong headwinds we gritted our teeth and cycled slowly towards Khiva. With four days to go we hoped the weather would change its tune and help us along! When it’s sunny and the road is good the kilometres fly by. In snowy, blustery conditions, however, the kilometre markers at the roadside take an age to appear. Each kilometre seemingly further than the last. When those markers are counting down from well over 1000, reminding you how far the desert stretches, it feels as if they are gently mocking you, laughing at your misery. Only another 1000 kms of desert! In the desert there is no protection from the elements. We needed no shade from the absent sun. Instead we needed shelter from the battering winds and the driving rain. A solitary parked truck gave us the moments of respite we craved before continuing our battle against Mother Nature. The only thing keeping us going was the knowledge that there was something called a silo in maybe 50km, even though we had no idea what this silo might be. 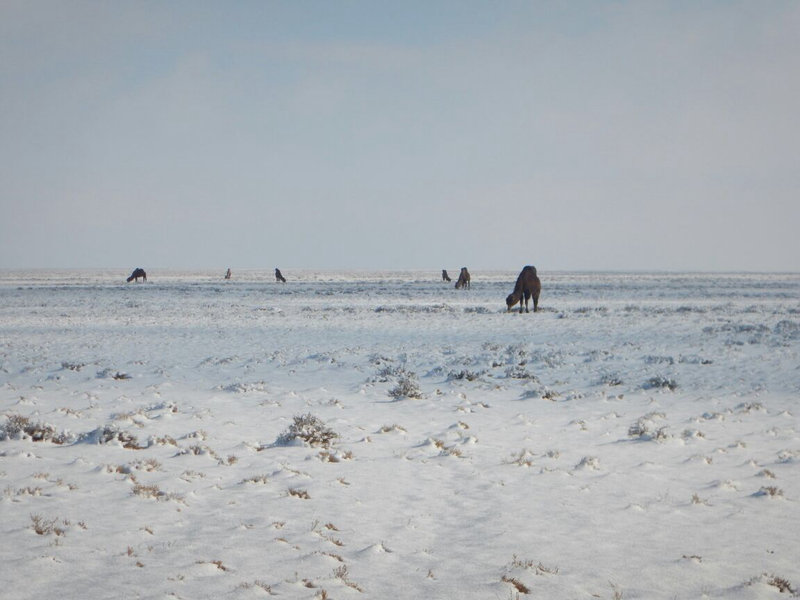 This was how it was in the Uzbek desert. We would be given a rough distance to the next sort of shelter by a caring motorist. Many kind people offered us lifts, but we had to politely decline, no matter how grim the circumstances were. The weather and road conditions came in swings and roundabouts. Just as we thought we couldn’t go on the sun might burn away the black clouds, or the road would miraculously become tarmac. Just as the bad didn’t last forever, neither did the good! But there was enough good to mean the distances were manageable, although we did have to ride deep into the dark hours. The horizon in the desert always seems far away, never really getting any closer. It’s even worse when it’s lights on the horizon at night. Cycling in the dark is not a hobby I wish to continue after this expedition. It’s fairly slow and extremely tiring, both physically and mentally draining. What would be easy riding in the light becomes an act of huge concentration as you focus on the spotlight of road in front of you. A light in the desert night suggests the end of the day, warmth, food and a bed. But that light takes an age to approach, seemingly endlessly distant. Our relentlessness was finally rewarded as the speck of light transformed into an American Diner, right in the middle of the desert. It served local food rather than burgers but it did have Wi-Fi, very expensive hotel rooms with pool and sauna, and a cute kid, the owner’s son, who became our number one fan for the day, trying on our hats, helmets, sun glasses and gloves. After another day of almost 150km we arrived in Nukus, a border town with Turkmenistan, our original planned entry point into Uzbekistan. We just wanted to eat and sleep before setting off early again the next day. A quiet meal of lagman (noodles) or plov (rice) was just what we needed. The first restaurant we entered had a DJ poster by the door. As we went in we could feel the bass vibrating though the whole place. Moving further inside pounding techno music greeted us. Four men stood on a tiny dance floor moving awkwardly to the heavy beat. Two men sat eating their meal to one side, unable to talk for the noise. We felt it best to move on. The next place we tried had a similar set up, this time the music – What does the fox say? Club remix – blared out from upstairs. The restaurant underneath reverberated. They served every kind of beef imaginable – British, American, Japanese, Canadian. All at London prices. Did they serve local food? “Here? No sir! This is not that kind of place.” was very much the feeling of how the waiter replied. We moved on. Microwaved somsas and a pot of tea in a corner shop was the best we could find. At least it was quiet! More desert. If you go to the satellite view on google maps of northwestern Uzbekistan you will see what it’s like! 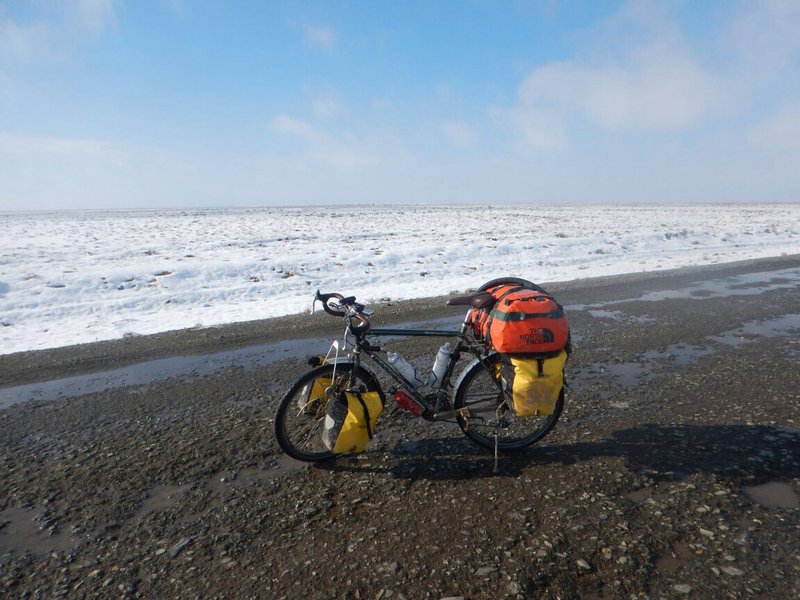 If it looks barren and tough on your monitor, imagine cycling through it! Up until this point we’d still seen pretty much no sign posts in Uzbekistan. Any signposts that there were had no distances. No one really knew how far anything was. A restaurant in 10km could mean 3km or 30km. This was a theme for our desert crossings: Uzbek estimates at distances are often wild guesses! 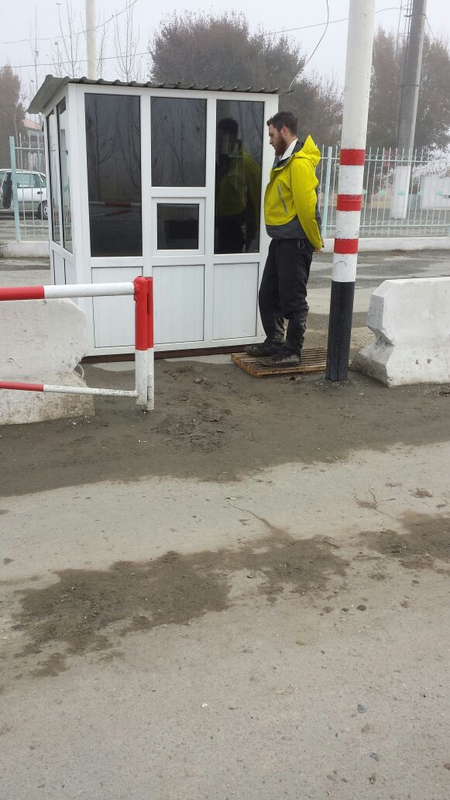 As we got closer to Turkmenistan we passed through army checkpoints. We were deep into Karakalpakstan, a region of Uzbekistan that desires independence but doesn’t really have the means to go ahead with it. Military presence seemed more obvious and the checkpoints more stern. As we looked for somewhere to stay a drunk man latched onto us, or more specifically Nick. He offered for us to stay at his place. The persistent “I love you Nick” and his general clinginess were enough for us to decline. It wasn’t so easy to get that message across and he was adamant he would not go home without us. Fortunately, perfectly timed, our guardian angel, Koshiva, an English teacher appeared on the scene. We were invited to her house and treated as most distinguished guests. 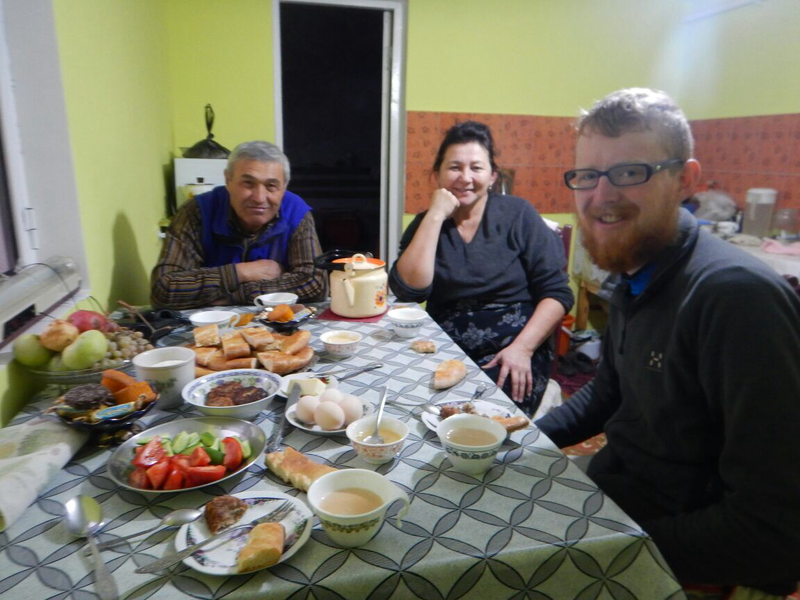 Hot food, beds and tea with milk were hugely welcome and it was fantastic to meet an English speaker who could answer all our questions about Uzbekistan. Interestingly, students now learn English as the second language over Russian – British English as the country is very anti-America. In the morning we were treated to a sumptuous breakfast and headed out into heavy mist. Eager to see just a little bit of Turkmenistan we found a road on the map that led to the border but didn’t seem to be a crossing. We rode down the lane off the main road to find an abandoned Uzbekistan border post, windows smashed, door missing and no barrier. In front facing Uzbekistan was a Turkmen guard tower. A pretend soldier was propped against the railings. As we left Uzbekistan into no man’s land, Turkmen guards came out of the tower room rifles in hand. We stopped where we were. One came down and Nick went to have a chat. I turned the GoPro on – never miss an opportunity! Nick asked if we could cross the border, take a photo and come back. The soldier radioed the guard tower past the border. After much deliberation we were denied access, understandably, and we continued on our way. Turkmenistan eluding us once again. Just by the border we were invited in to a restaurant, which turned out to be a wedding banquet restaurant, for lunch. We explained that we couldn’t stay for the evening wedding. 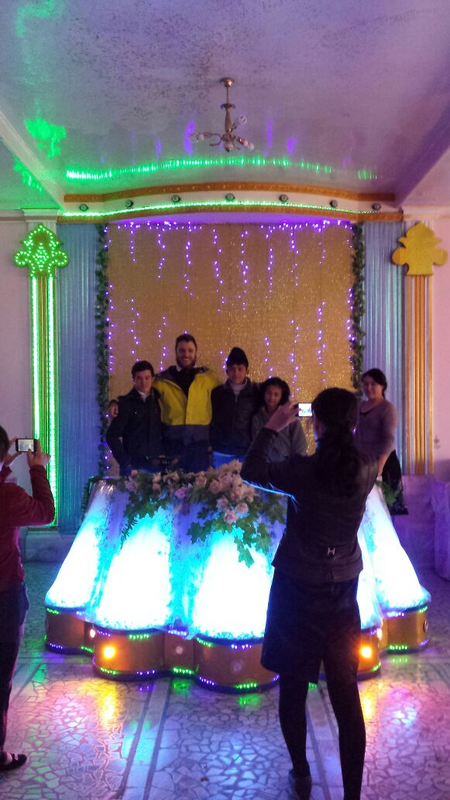 But we took lots of photos with the family working there, standing where the bride and groom would that evening, flashing neon lights, fake flowers and LED curtains providing the backdrop to the photos. 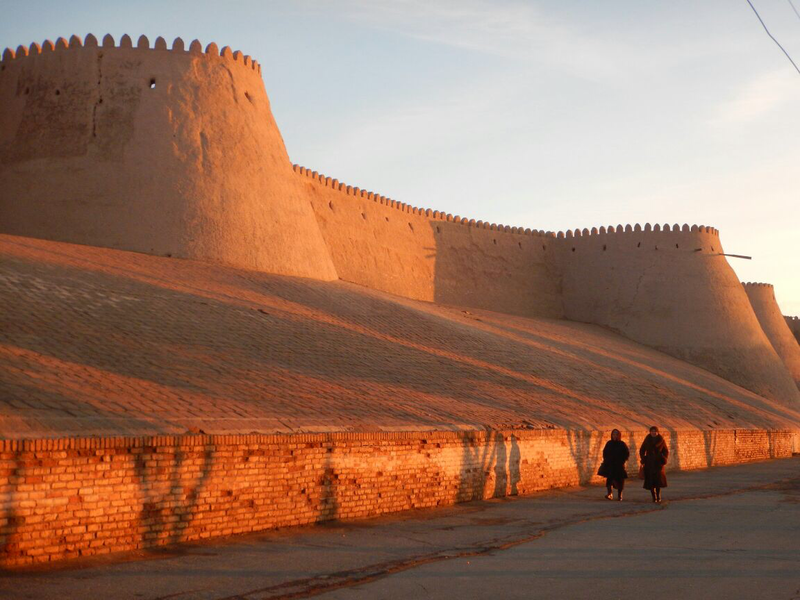 As the sun set, on our final stretch into Khiva the great stone walls of the old town appeared in front of us, marking the end of our first leg in Uzbekistan. “We’ve cycled here from London!” we kept repeating. Following the ancient Silk Road, it seemed apt to be staying in one of the old towns, just as the caravans would have done all those years ago. 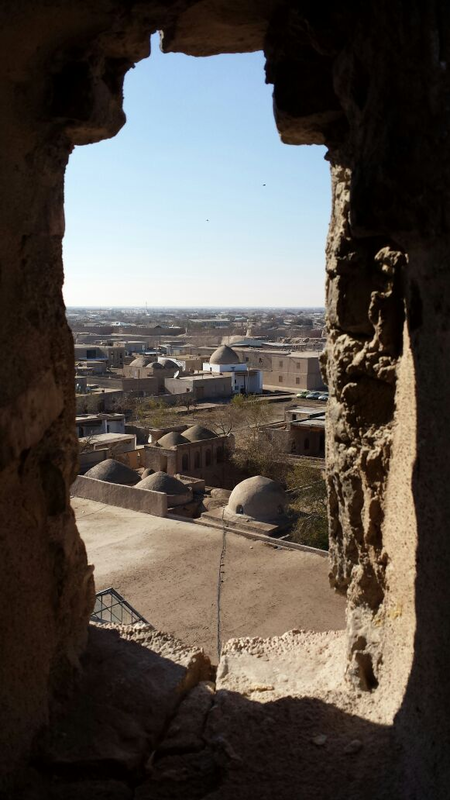 A walled town filled with madrassahs, mosques and minarets, it was a beautiful location and a historic treasure. On our much deserved rest day we explored the market, climbed the minarets and scrambled on the city walls. A huge event was taking place in the main square. We assumed a wedding, but found out that it was National Youth Day and students from all over Uzbekistan were gathered here in Khiva. National television was there to cover the event and were quick to ask us for an interview. We couldn’t decline an opportunity for publicity! We did have to pass when we were asked to dance the extremely technical national dance, leaving it instead to the nimble and much more skilful local girls. 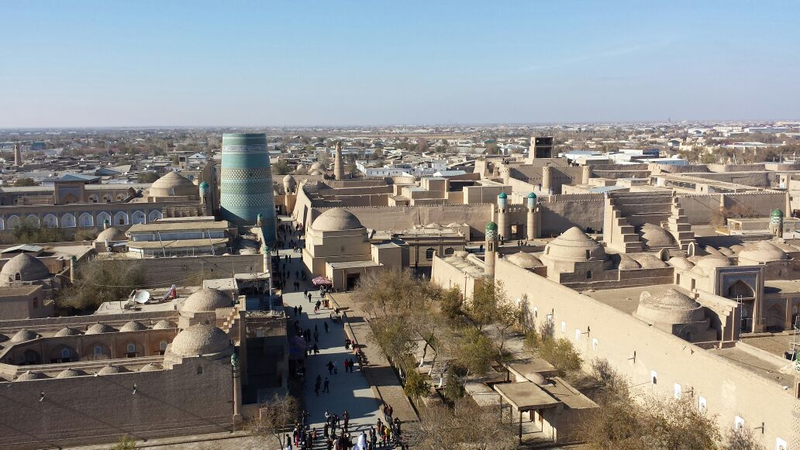 Bukhara is our next destination, another oasis town, the other side of yet more desert. Stay tuned for Nick’s Desert Days Part Two! 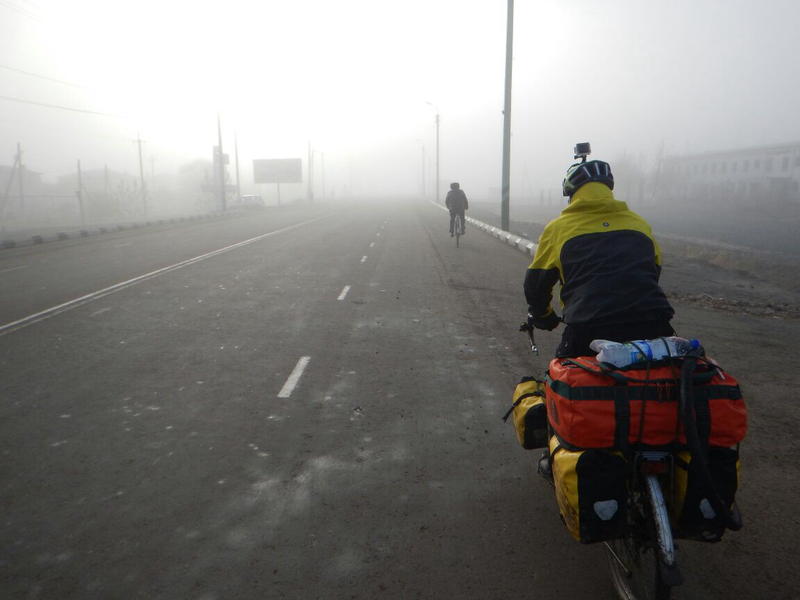 This entry was posted in Uncategorized and tagged Cycle to the East, cycle touring, Khiva, Kyzyl Kum desert, Laurence Gribble, Nick Codrington, Prostate Cancer UK, Turkmenistan, Uzbekistan. Bookmark the permalink.